The Steering Committee is the main governing body of the Alabama Republican Committee. The 21 member committee meets once each quarter and helps define the direction of the Party while preserving and promoting the values of the Republican Party. The Committee is comprised of the state chairman, the two RNC members, senior vice chairman, three vice-chairs, secretary, treasurer and representatives from each of the seven congressional districts. 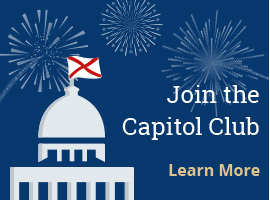 Four Republican auxiliary groups also have representation and are comprised of the Alabama Federation of Republican Women, Alabama GOP Minority, Young Republican Federation of Alabama and the College Republican Federation of Alabama. The congressional district representatives and auxiliary members are elected by their respective districts or organizations. All other officers are elected by the full State Executive Committee.